Minecraft is one of the most polarizing PC games in recent memory. Either you play and enjoy it or you think it’s the biggest waste of time ever put into code (I’d still reserve that title for Microsoft’s Windows-bundled solitaire games personally). It’s lack of a distinct goal or ending as proof that it’s not a game. And while they’ve got the reasoning wrong, I have to agree. It’s not a game. However, in the same way that The Sims (and Sim City, and the rest of the Sim series) is a game, so too can Minecraft use that designation. In particular it’s a sandbox game. You’re given a world, some rules, and are left to your own devices. Minecraft throws some curveballs at you in the form of monsters in the dark and an enticingly random world but by and large you get out what you put in. If you need the game to hold your hand, point you at a goal, and give you a reward at the end for doing what you were told, then Minecraft is not for you. However, if you enjoyed creating random chaos in Grand Theft Auto or ditched the main quest for randomly wandering the countryside in Oblivion, you can probably enjoy being given a world with which to do whatever you’re interested in. There are those who thing megalomania is a prime trait of Minecraft players, but I think creativity is the more critical factor. In the past I’ve enjoyed using TNT to see what kind of destruction I could cause. Why use one TNT to take down my original house when I have eight? In the words of the Mythbusters TV show, if it’s worth doing it’s worth overdoing. In short, I broke the world. It’s that ‘what if’ that draws allot of players to Minecraft. What if I built that tower to the sky? 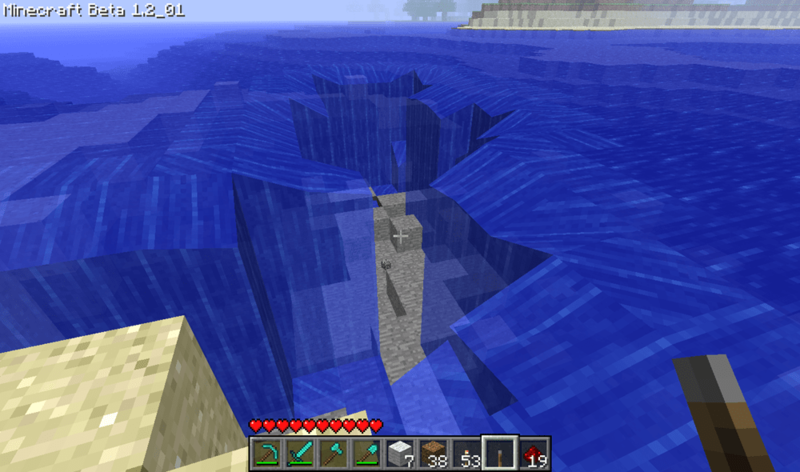 What if I tried to create an underwater city? What if I rebuilt my house in game? What if I broke the world? As I said at the top, Minecraft not so much a game as a toy. However, it could never go by this description for one reason: when people hear ‘toy,’ they think ‘kiddie.’ It’s a stigma that’s tightly engrained in modern culture and it’s not seen as unseemly for a grown adult to play with toys or other supposedly ‘kiddie’ things like an impromptu read-through of an old book you liked while you were young (however, some things like showing up to a gathering with a pacifier in your mouth are not and will never be ‘cool’). A portion of the Nintendo Gamecube’s lackluster sales is blamed on it’s compact size, Play-Skool styling and lunchbox handle (unlike it’s underwhelming library or cheaper price branding it as the ‘budget system’ to uninformed buyers – they obviously played no part). Why would this even be an issue? If your not confident in who you are and require your choice in game console and said console’s appearance to validate you, then I have bad news for you: you’ve got other problems. I’m obviously arguing for Minecraft because I see it’s value. Let’s take up the other side for a moment though, because I can see it, too. There are times when I wonder what the hell I’m doing. Why am I digging another cave? Why am I building another building? Why don’t I just play another game that actually allows me to have tangible progress? Even with stats and achievements, you really aren’t ever going to make any real, measurable progress towards anything. You may build the most beautiful tower and castle ever, but other then wander around it and say, “gee, that’s pretty,” what’s the point? Build something else? Why bother? I’ve nearly quit several times when I hit a wall and was tired of making and mining. The fact I didn’t is completely personal preference. The result comes down to how much you enjoy making your own fun. My best test is this: if you’re given the option between playing with a the greatest model world or pile or blocks for two and a half hours or watching an average movie (standing in for the likes of The Sims Medievals of the world) for the same amount of time, which would you take? Obviously if it’s a great movie (a game like Portal 2) then you’d want the movie almost every time. 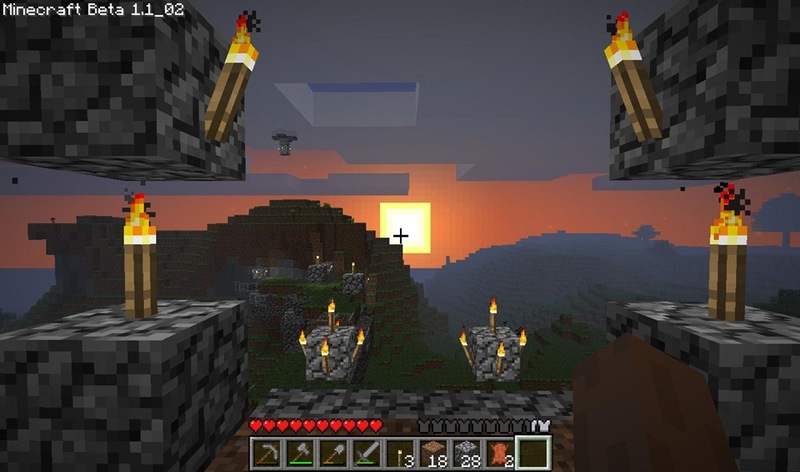 However if you could take or leave the movie/game and would pick the model world and/or blocks, or jump at the chance to take the former, then Minecraft could be for you. If not, then you would be best served to try the demo at PC Gamer before buying the game. You may find that the creative side of you enjoys it. Or not. Really, if you like the game play it, and if you don’t then let it go. I really hate people arguing over a game being good or not. Not everyone has to share your taste in games. We’re all different, and that’s why there are so many games. Now if you’ll excuse me, I’ve got a subaquatic subway to finish.